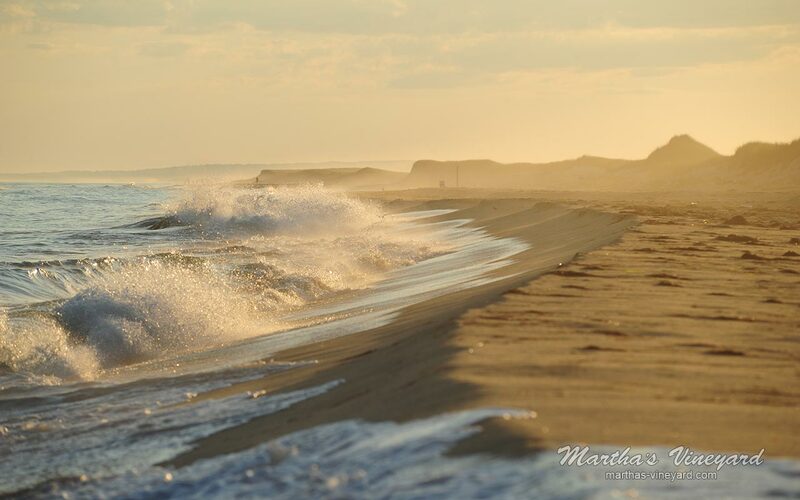 A trip to Martha’s Vineyard is not complete without a visit to one or more of our beautiful beaches. You will not be disappointed. There is a beach for everyone. Want to surf, windsurf, kiteboard, dip your toes, take your kids, swim, lay on the beach, there is a beach for you! The majority of the beaches in the down-island towns - Vineyard Haven, Oak Bluffs and Edgartown - are public. They are also easy to access. The Shuttle Bus will be able to drop you off at most of the beaches. In some cases, you can even walk from town. Most of the beaches up-island - West Tisbury, Chilmark and Aquinnah - are either privately owned or are for the specific town residents. Those beaches require permits and/or beach stickers. If you are a renter in one of those towns, you can apply for a permit at the town halls. Call the Town Hall in the town you are interested in, to get the requirements. West Tisbury, 508-696-0147; Chilmark, 508-645-2100; or Aquinnah, 508-645-2300. Cost could be in the $50 range. The up-island lodging establishments, usually offer a temporary permit to their guests. Leave nothing but your footprints! Owen Park Beach: In town off Main St, on the harbor, close to the ferry terminal. Great for kids, or an impromptu picnic while waiting for the ferry, calm seas. Views of the ferry coming and going as well as several private sailboats and yachts. There are also a few iconic sailing vessels moored in the harbor. Limited parking. Owen Little Way Beach: This is the Vineyard Haven Town Beach. Almost every child in Vineyard Haven took swim lessons at this beach. Next to the Vineyard Haven Yacht Club. Limited parking. Lake Tashmoo Town Beach: You will need your GPS to find Herring Creek Rd off of Daggett Ave. The ride is a long dirt road. Most of it is one lane. At the end, you will find a small sandy beach that is both on Lake Tashmoo and the ocean. The lakeside has warm water, oceanside, colder water. Lots of boats coming into the lake from the ocean. Hidden gem. No amenities. Limited parking. Eastville Point Beach: Located on the Oak Bluffs side of the drawbridge on Beach Rd. Small sandy beach with views of the ferries coming and going from both Oak Bluffs and Vineyard Haven. Great beach to stop at on your bike. Great fishing. No amenities. Limited parking. Oak Bluffs Town Beach: You can walk to the beach from Town or ferries. Sandy beach with calm waters. Great for families. Begins by the Steamship Dock. Back in the day, local children and young tourist alike would ‘dive for coins’ as the people came off of the ferry and walked up the dock! The last little strip of beach as you walk towards Edgartown is called the Inkwell Beach. Food is located all over Town. Restroom facilities are located right next to the Steamship Authority office. On street parking limited. Joseph A. Sylvia State Beach: As you leave Oak Bluffs going towards Edgartown. One of the most popular beaches on the Island. As you cross of the little bridge, you’re there. The beach is shared by both Oak Bluffs and Edgartown. In total, the beach is about 5 miles long. It has gentle waves, great for families, sunning and swimming. Bring your snacks, etc. There are a couple of snack trucks. No facilities. During windy days is when all of the kiteboarders and windsurfers come out to enjoy the big wave rides on both sides of the road in Sengekontacket Pond. The Shuttle Bus will drop you off. Get there early if you are driving, parking is hard to come by. Best way to get there is by bike. There is a bike path adjacent to the beach. South Beach (Katama Beach/Norton Point Beach): Located about 4 miles outside of Town at the end of Katama Rd. One of the most popular beaches on the Island. Huge waves, open ocean, not good for swimming or children. Very popular with surfers. Families usually congregate on the ‘left fork’ - college kids on the ‘right fork.’ Deep sand for making sand castles. Easy bike ride from Town on separate from road bike path. Parking OK as long as you get there early. There are facilities. No food. 4-wheel drive vehicles with permits, can drive onto Norton Point Beach (next to South Beach) to fish or enjoy the beach. Permits are costly. May range up to $60 or more for a day pass. Fuller Street Beach: Located in Town at the end of Fuller St. Calm water. Beach is very peaceful. Lighthouse Beach: Off North Water St in Town at Starbuck Neck. Next to Fuller Street Beach. You can walk from Town or ride a bike. Parking is an exercise in futility. Chappaquiddick (East Beach, Wasque Reservation & Cape Poge Wildlife Refuge):Take the On-Time barge from Memorial Wharf in Edgartown. There is a cost for bikes, cars and passengers. This is an absolutely beautiful beach owned by the Trustees of the Reservation. You can fish, swim, walk the trails or birdwatch. Being here is like having your own beach. Never crowded. Worth the effort to get there. Bring what you need with you. Long Point Wildlife Refuge, public: Located off the Edgartown/West Tisbury Rd, just past the airport on the left. Long dirt road down to the beach. Limited parking. Arrive early to get a space. During the season, there is parking at the airport and a shuttle bus to take you to the beach. Watch for signs.There is a long walk with all your stuff to the water. You’ll find a couple of ponds with very calm water where you can kayak, paddleboard and swim. You can also cross over to the ocean for big waves. Plan to be there most of the beach day. Bring everything that you will need. Don’t forget sunscreen.Too much work to pack up and run back for something you forgot. Lambert’s Cove Beach, residents and renters only: Public is usually allowed after 5 p.m. Long walk down to the beach from the parking lot. Beautiful, soft sand underfoot, peaceful beach. Clear, calm water with beautiful sunsets. No crowds. Menemsha Public Beach: You could literally spend your entire day at this beach. Be sure to bring an umbrella for some shade for the meat of the day. Get there in the morning. There are lots of restaurants, fresh fish markets that will cook a lobster for you, deli, sashimi, oyster bars, clam shacks and fine dining in Menemsha. Now you know where to eat. The beach has calm, clear water, great for kids. There is a jetty for fishing and a working fishing village. Laze around at the beach all day. Before the sun goes down, break out the Champagne or wine, your food and sit back and wait for a spectacular sunset. Great way to kill a day! Now go home and sleep it all off. There are also facilities right at the beach. Lucy Vincent Beach, residents and renters only: Public usually allowed after September 15ish. Beautiful beach on the south shore of Chilmark. Quiet, clean and scenic. Watch the rocks in the water. Get there early so you won’t have to wait. Parking limited. Squibnocket Beach, residents and renters only: The beach has been completely excavated to a much smoother version of itself. It is an absolutely beautiful beach on the South Shore of Chilmark. Moshup Beach (Aquinnah Public Beach): A beautiful, clean, surf beach with spectacular views of the Gay Head Cliffs. Paid parking is available off Moshup Trail, at least $15 per car. From the lot, there is a long walk to the beach. Parts of the beach, long walk to another area, are clothing optional! This section may be off-limits due to erosion. Facilities available. Philbin Beach, residents and renters only: A Beautiful, clean, surf beach located right next to Moshup Beach. Lobsterville Beach, public: A popular beach for fishing, snorkeling and bird watching. Calm waters on Vineyard Sound.. Parking extremely limited.